Liberal has been winning but Carter Kruger wants more. The Liberal head coach challenged his team to pick up their play a notch with the playoffs two weeks away. 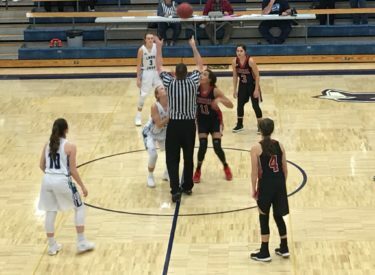 The girls answered that call Tuesday in Cimarron with a 61-27 win in a game which used a running clock for the fourth quarter. Liberal led 16-7 after one quarter after Cimarron’s Taylor Jantz hit a half court shot at the buzzer. The Lady Skins led 33-13 at halftime. LHS claimed a 53-21 lead after three. Katie Horyna scored a career high 24 while Ali Lucero dropped in nine and Whitney Hay had eight. The Lady Redskins are 16-1 for the first time since 2009. Cimarron is 11-7. Liberal plays at Great Bend on Saturday night with Redskin Pre-game at 5:45 on 1270 and kscbnews.net.